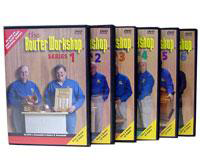 Each series is a 2 disc set with over 5 hours of this popular program. All sales are final, no returns. Series 1 of The Router Workshop Excellent for the beginner! Click here To View full color pictures of these projects. A project book or individual plans for these projects is available separately.